As an Angel of Death, has seen countless souls ferried to the other side, and has become a little numb to the pain and loss associated with it. But all that changed when that loss stuck home and she is left a grieving mess. But there is a small matter of hope with the new life growing inside of her, a happiness that is lessened once Maddy realizes her unborn child would be a mighty temptation for Lucifer. A child of two of his bloodlines would have untold power, and Maddy is determined to keep that from his hands no matter what that takes. Meanwhile, the rest of the courts are still stirring trouble and Maddy has had about enough. This time she'll be taking the fight to them. This was an incredibly difficult and emotional read for me. Heart ache absolutely kills me in a book, especially when it comes from something as permanent and devastating as death. My heart was in every bit as tatters as Maddy's was, and each time she broke down, my heart bled for her. I cannot count the number of times there were tears in my eyes when everything became too much for Maddy. That being said, the ability to affect my emotions that strongly shows just how good these books are and how real the characters are. If the emotion didn't impact me, well then it wouldn't be worth reading. 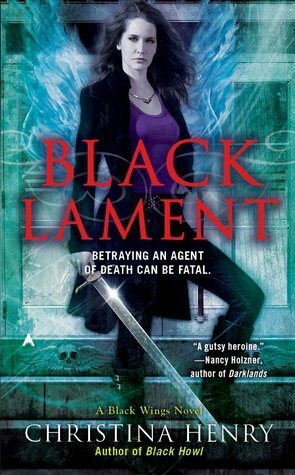 After reading Black Lament, my respect for Maddy has seriously ratcheted up another notch. Despite the immense emotional pain she was in, she still found a way to stand strong, especially once threatened. It didn't take long at all for her to go all "Momma Bear" and start eliminating current and future threats to herself and her unborn child. At several points throughout the book, her gargoyle companion, Beezle, seems to worry that she is turning over to the dark side, but I don't have the same worry. Sure she is making decisions she never would have in the past, but her actions are justified by the means. She hasn't sought out the trouble that finds her, she only refused to back down when others wanted to either control or destroy her. Granted, she has become a little more proactive in her defense as she began to take some steps to prevent future attacks rather than waiting to be ambushed, but in all honesty I can't blame her one little bit for that. She has no desire for world conquering and if everyone would just leave her alone, she wouldn't be a threat to any of them. I have to admit that a part of me didn't want to continue on with this series after the heart shattering ending of the previous book as I just didn't want to face the reality of the horrible changes Maddy would have to face. But in the end it was more than worth it to push through it and keep reading, as Maddy and the gang are still some of my top favorite sets of characters. I highly recommend Black Lament as it is full of both emotion and action that will keep you sucked in from the very start. This series just keeps getting better!